If you measure the heights of the two circles shown to represent these costs, the ratio comes out to approximately 7.2:1. It is not completely accurate, but it is still close enough that we can ignore it. However, when using a bubble or circle to compare two values, we are implicitly using the areas of the circles to base our comparison on. In case you have forgotten your geometry, the area of a circle is Π×r2 (i.e., pi times the square of the radius). Using this, the ratio of the areas of the two circles is 55:1! Yikes. 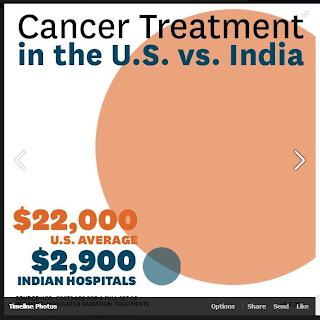 Put it another way, HBR is saying that if cancer treatment in the US costs $22,000, then in India it should cost $400. Or, if it costs $2900 in India, it should cost $159,500 in the US. Either way, this is wrong.